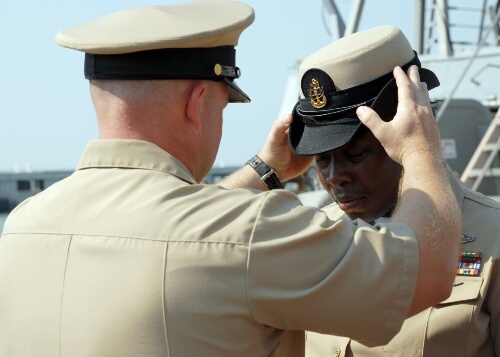 The Norfolk-based destroyer McFaul broke ranks Thursday and pinned its five new chief petty officers day earlier than the rest of the Navy. There was a good reason for that. McFaul did so to accommodate a scheduled deployment. 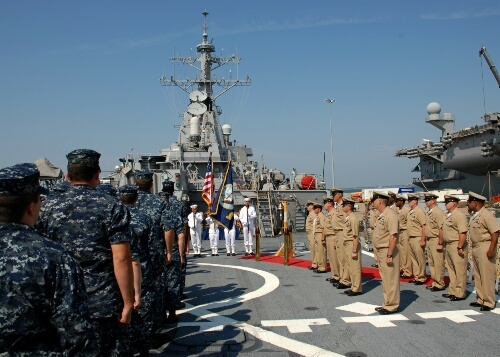 So even when a short-notice delay changed that deployment date, the ship held the ceremony so as not to exclude family members who’d traveled to take in the rich tradition. “It was very important to have my family here with me today,” said Chief Logistics Specialist (AW/SW) Tamika Tillman. “I can’t even describe what it means to have them present.” Tillman was pinned by her daughter, son, fiancé, fiancé’s grandparents and her best friend of 17 years. Also entering the McFaul Chief’s Mess Thursday were Chief Engineman Christopher Brown, Chief Fire Controlman Daniel Chenowitz, Chief Sonar Technician Surface Johnny Nichols and Chief Fire Controlman Corey Stowe. Command Master Chief (SW/SCW) Dianne Lohner shared the importance of the day and welcomed the new chiefs to the mess. 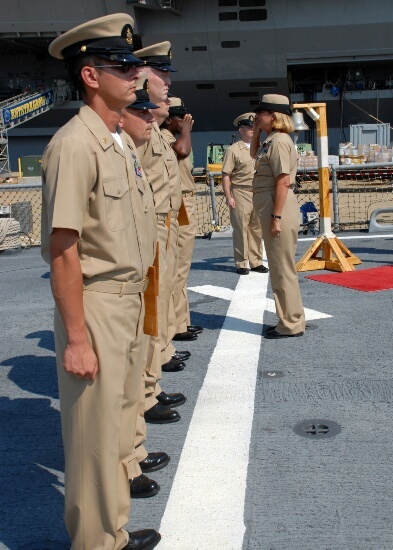 Our hearty congratulations to the new McFaul chiefs, and to new chief petty officers everywhere. Congratulations to all the new chiefs!! It was great getting to know a few of you during the Tiger Cruise, and we wish you all the best of luck! !